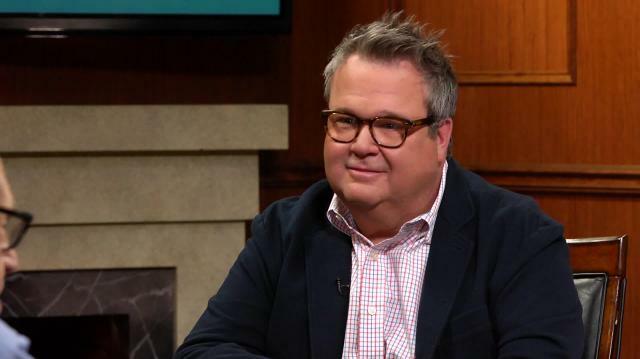 Eric Stonestreet opens up about the ‘Modern Family’ cast’s contract negotiations, their uproarious text chain, and trading places with Sofia Vergara in this wide-ranging interview. Plus, the actor on having Tina Fey for a teacher, and his past as a clown. Co Creator and Star Josh Gad On Giving up "Modern Family" to Be in "Book of Mormon"
Larry King interviews Eric Stonestreet, the two-time Emmy-winning star of ABC’s ‘Modern Family,’ which is currently wrapping up its eighth season. Stonestreet also hosts ABC’s ‘The Toy Box,’ a toy invention competition series. King asks him about his ‘Modern Family’ contract, and Stonestreet talks about how people are hopeful for another season, and how he believes the cast is equally great. King inquiries if he enjoys playing a gay character, and Stonestreet says he enjoys playing the character and that the show has brilliant writers who create surprising scenarios. King asks Stonestreet about the current scenario of Trump’s presidency, and Stonestreet says he doesn’t know what to say, but that there are lots of negative things. Larry asks about ‘The Toy Box,’ which Stonestreet describes as a show where toy inventors first pitch to established adults. If they get past this, they go inside the Toy Box, where the judges are four children who decide if the inventor moves towards the finale. The winner will get a deal with Mattel, which will produce the toy and sell it through Toys R Us when the show ends. Stonestreet talks about trendy toys and the ability of kids to judge adults, some of whom have spent huge amounts of time and money on their inventions. From toys, Larry transitions to temperament. He asks Stonestreet to explain how his personality is darker than drier than that of his ‘Modern Family’ character,’ and Stonestreet talks about having a stranger mind. Since Stonestreet’s character is a clown, Larry asks him what makes a great clown. Stonestreet believes it comes from the heart, and laments the recent fad of fearing clowns. He talks about the fun of being a clown on ‘Modern Family,’ and how even as a child, he did clown shows for other kids, complete with magic and balloons.